Some recipes instruct you to grind herbs or spices. In our grandmother’s day, that meant using a mortar and pestle. In our mother’s day, it meant using the coffee grinder for herbs and spices. Mom, a purist, had a second grinder for that purpose. Other folks had to first grind uncooked rice in their coffee grinder to remove minute particles of coffee, or else suffer coffee-accented spices. Today, manufacturers are doing more to meet the needs of home cooks. McCormick, for example, sells four popular herbs—basil, Italian blend, oregano and parsley—in non-refillable glass grinder bottles (center photo). 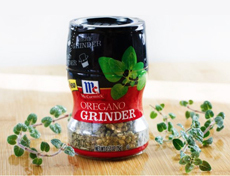 On the spice end, McCormick has grinders for peppercorns and peppercorn-herb blends, seasoned salt blends and plain salt grinders. There are herb mills and spice grinders, a.k.a. mills, but we especially like the new Kyocera “Everything Grinder” (bottom photo—more about the mill below). Technically, “mill” refers to the entire device and “grinder” to the grinding mechanism inside the mill. Herbs, minerals and spices are three options to flavor foods. Herbs are parts of leafy green plants, such as leaves and stems. Spices are bark, berries, fruits, roots or seeds of plants. Peppercorns are the berries of a vine. Minerals are solid inorganic substances. Salt is a mineral. Other minerals used in cooking include baking powder, baking soda, citric acid, MSG and tartaric acid. Sugar is not a mineral since it is derived from the sap of a plant. Herbs and spices lose their flavor over time, but salt retains its flavoring. 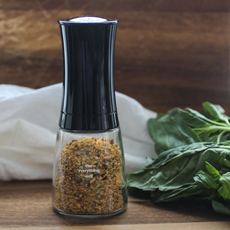 Now, one mill grinds everything: dried herbs, pepper, salt, seeds and spices: the Kyocera Everything Mill With Adjustable Advanced Ceramic Grinder. The company states that its advanced ceramic burr mill mechanism, close in hardness to a diamond, will outlast any metal-based grinding mill. Is adjusts from fine to coarse grinds. 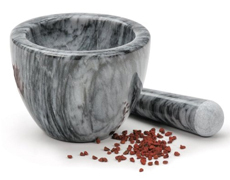 Top: Marble mortar and pestle from RSVP. Center: McCormick Spice Grinder. Bottom: Kyocera Everything Mill. The mill features a glass body, ceramic grinding mechanism and acrylic top. The glass base is dishwasher safe, and all components are rustproof. In addition to salt and peppercorns, you can grind celery, cumin, dill, flax, mustard and sesame seeds; any spices including red pepper flakes; and any dried herbs. To grind pliant fresh herbs you’ll still need a mortar and pestle (preferably) or a spice mill/coffee grinder with a metal blade. We’ve tried both and strongly recommend hand-grinding with a mortar and pestle for the finest flavor. Metal blades tear the leaves in a way that releases the oil in a different way. You’ll also need the mortar or metal blades stop grind nuts. But for most grinding, you can count on the Kyocera Everything Mill. There’s a color for every kitchen: Apple Green, Bright Black, Brilliant White, Candy Apple Red, Translucent Blue and Translucent Maroon. At $19.95, they make good gifts for your favorite cooks. All colors are available on Amazon.com. FUN: The History Of Coffee Grinders.